I don't use my crock pot nearly as much as I should, and I'm always reminded of that when a meal like this comes together so easily. The next few months are going to be crazy busy around here, so I'm going to do a little crock pot experimenting and see if I can come up with a few time-saver recipes that will make weeknight dinners a bit easier. This is a great meal that we've made many times and it's perfect when you're in need of hearty comfort food. 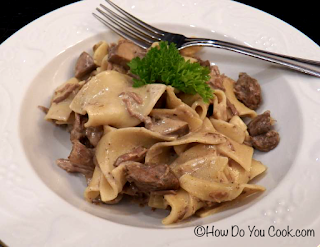 With a Dijon mustard and sour cream sauce, this crock pot version of Beef Stroganoff can be made with any type of beef, such as round steak, chuck, or even sirloin. By using a crock pot, less expensive cuts of meat will cook low and slow and the results will be tender bites of beef that are loaded with slow cooked flavor. So buy whatever cut of beef your local market has on sale this week and this great dinner will even be a bargain. This meal takes about 15 minutes to prepare, then about 5 hours of cooking on LOW. Adding the noodles and cream sauce during the last hour will bring all of those good flavors together. Heat a large skillet over medium-high heat. Add the olive oil and heat until shimmering, then add the beef and saute for 3 minutes, stirring a few times. Add the garlic, mushrooms and black pepper and saute 4 minutes longer, until the mushrooms are just softened. While the beef and mushroom mixture is cooking, add the soy sauce, red wine vinegar and beef broth to the crock pot. Turn heat to LOW and cover the pot while you finish the beef. Pour the beef and mushroom mixture into the crock pot, replace lid and cook on LOW for 4 hours. Near the end of the cooking time, boil the noodles in a large pot and cook until just al dente, but not fully cooked. Drain the noodles. Add the noodles, sour cream, Dijon mustard, white pepper and salt to the crock pot and stir very gently just to combine. Replace the lid and cook for 30 minutes longer on LOW or until heated through. Add salt or black pepper to taste. Enjoy!! I love beef stroganoff, but I haven't had it in forever. To be honest, I don't even know if I have made it before haha. Thanks for sharing, you may have just inspired me to make it soon! I'm so glad you've been inspired! lol This is a really great meal. Enjoy!! How many ounces of mushrooms do you add? It's not indicated in the ingredient list. Thanks! Use about 6 ounces of mushrooms, or more if you would like. Thanks for visiting and I hope you enjoy the Stroganoff.